The metatarsophalangeal joint (MTPJ), formed by the metatarsal and phalangeal bones of the toes, is the location of common foot pathologies. The two most prevalent sources of pain in the MTP joint are the conditions of hallux valgus, a precursor to bunions, and hallux rigidus, stiffness in the big toe. A well-researched etiology (cause) for these conditions is ligament laxity. In this study, twelve patients were treated with a series of Dextrose Prolotherapy injections to stimulate the regeneration of tendons and ligaments and to promote the repair of articular cartilage. Upon completion of three-to-six therapy sessions, eleven of twelve patients had a favorable outcome—the relief of symptoms—with an average of four treatments. Based on such positive, verifiable results, Hackett-Hemwall Dextrose Prolotherapy can be viewed as a promising alternative to steroid injection, surgical repositioning (e.g., chevron osteotomy), or joint replacement. Chronic foot pain has reached epidemic proportions in the United States with over 40 million people reporting problems in their feet. 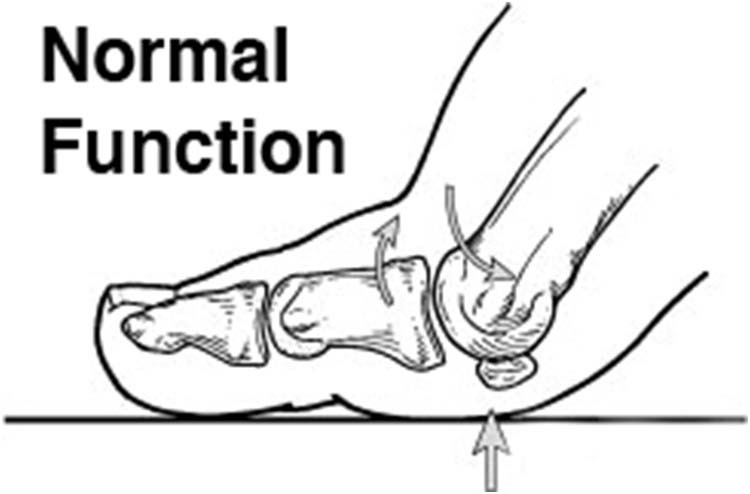 A typical cause of foot pain is deformity in the first metatarsophalangeal (MTP) joint, commonly called a bunion. The American Academy of Orthopaedic Surgeons reports, “more than half of the women in America have bunions, a common deformity…” and “nine out of ten bunions happen to women.” According to the AAOS, bunions are one of the most widespread, chronic foot complaints addressed by foot and ankle specialists. 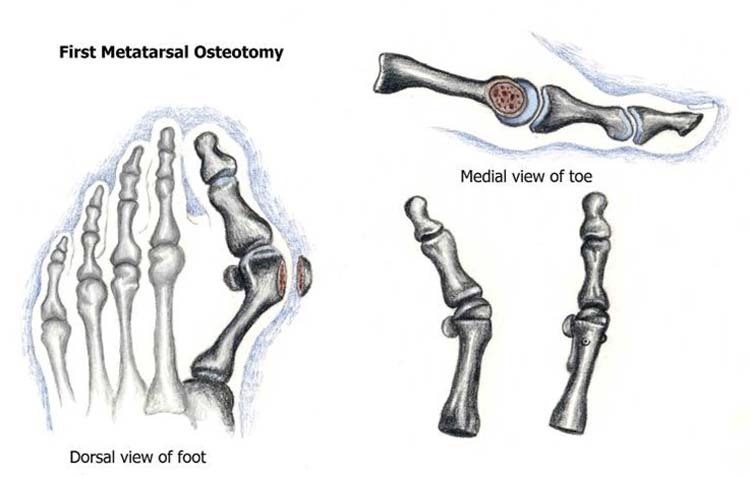 Surgical reconstruction of this joint, therefore, is one of the most prevalent joint surgeries performed on the foot. The two most prevalent causes of pain in the MTP joint are the conditions of hallux valgus and hallux rigidus, with hallux valgus being more and hallux rigidus less frequent. 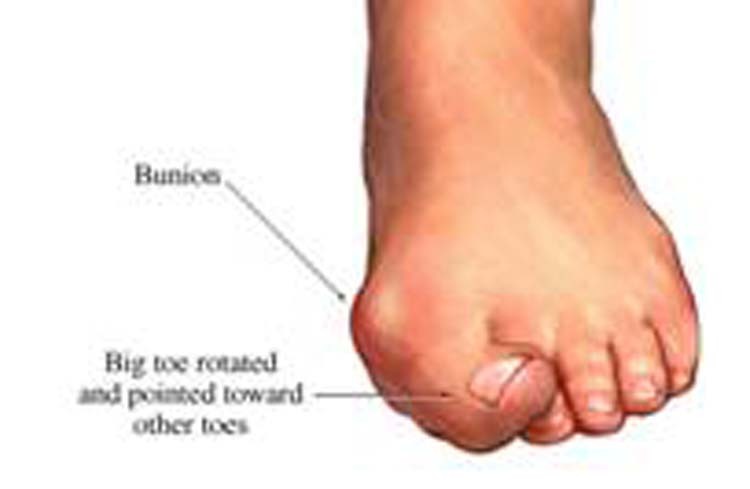 [3, 4] Hallux valgus, specifically, is a deformity that occurs when the big toe angles toward the other toes (Fig. 1). 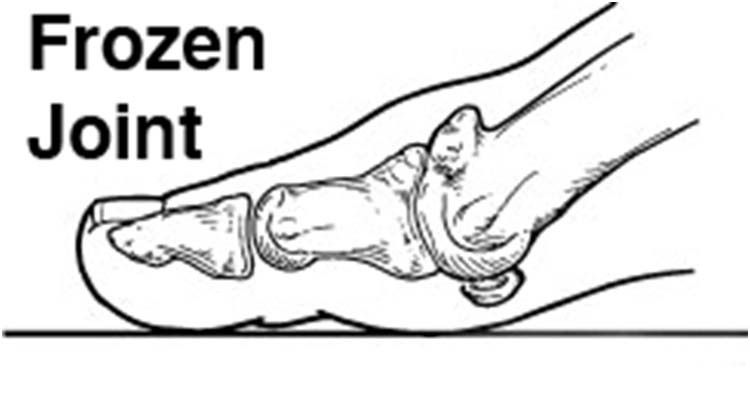 This shift in the toe leads to the formation of a bunion, a boney projection on the medial side of the toe that attempts to stabilize joint motion. (Fig. 2) In addition to hallux valgus, hallux rigidus also afflicts the MTP joint. Hallux rigidus is the condition caused by degenerating cartilage in the MTP joint, which eventually leads to osteophytes (bone spurs) forming around the joint—the body’s attempt to stabilize the joint. The bone growth associated with hallux valgus reduces movement in both flexion and extension (compare Fig. 3 and Fig. 4) and thus leads to hallux rigidus and potentially the worst outcome, a frozen joint. Figure 2 X-ray image of a bunion. Studies indicate that these painful foot conditions affect various groups differently. One study estimates that 33% of adults who wear shoes show some degree of hallux valgus. Other studies report that women are affected in greater numbers than the general population. In one study, Dawson found that 38% of fifty- to seventy-year-old women have bunions, which directly result from hallux valgus. [7, 8] Hallux valgus especially afflicts the elderly. Using a sample of seventy-one adults from 75 to 93 years, Menz and Lord reported that 70% have hallux valgus. Also, those with congenital ligament laxity, including patients with Down’s syndrome, may be more prone to hallux valgus. This painful foot condition compels patients to seek a variety of prescribed, available treatments. All the patients in this study had had some other form of therapy before Prolotherapy. Among conventional therapies, surgery is often prescribed for hallux valgus and the resulting bunions. Torkki notes “hallux valgus surgery is among the most common orthopedic operations in Western industrialized countries”; roughly 209,000 hallux valgus surgeries are done annually in the United States. Not only is surgery on the first metatarsophalangeal joint common, but it is also the fourth most frequent surgery, preceded by operations on the knee, hip and lower back. Due to a lack of consensus on the efficacy of surgery and other conservative treatments, patients are considering alternative methods, including Prolotherapy. Because first MTP joint pain—a common orthopedic ailment—is difficult to manage, this study investigated Dextrose Prolotherapy injections in order to establish the efficacy of this treatment with a study group and, subsequently, with patients afflicted with several painful conditions. The term Prolotherapy was coined in the early 1950s by a trauma surgeon from Canton, OH, George S. Hackett M.D. In the introduction to Ligament and Tendon Relaxation Treated by Prolotherapy, Prolotherapy is defined as “…a method of injection treatment designed to stimulate healing.”  Specifically, Prolotherapy utilizes a variety of irritants in solution that are injected into the ligaments, tendons, and joints to encourage repair of damaged tissues. In the preface to the third edition, Hackett describes Prolotherapy as strengthening “the weld of disabled ligaments and tendons to bone by stimulating the production of new bone and fibrous tissue cells….” Modern scientific research has shown that Prolotherapy initiates inflammation, which increases blood flow and growth factors to the injected area, thereby stimulating fibroblast activity and eventual ligament and cartilage maturation. This retrospective study collected data from twelve patients—4 males and 8 females, ranging in age from 30 to 60, mean age of 50—with hallux valgus. Of the patients studied, 100% had tried alternative treatments, among which were splints, orthotics, and surgery. Exclusion criteria included age: no one under 18 could be a study participant. Patients complaining of diffuse big toe pain were treated with Prolotherapy. To prepare patients, their vital signs were recorded; medical histories were obtained and documented. The treatment process began with a patient assuming a supine position on the table. Then 5% Lidocaine cream was applied to the area to be injected 10 – 15 minutes prior to the treatment. Once this time lapsed, the cream was removed with 3% hydrogen peroxide. After this preparation process, the area was cleaned with Chloraprep® (chlorhexidine gluconate 2% and isopropyl alcohol 70%). Then a 15% Dextrose, 0.1% procaine, 10% Sarapin solution was injected into the following areas: the capsular ligaments; sesamoid bones; base of first metatarsal bone; the attachments of these two tendons—abductor hallucis and flexor hallucis brevis—to bone; and first metatarsophalangeal ligaments. Using aseptic techniques, a 10 mL syringe was filled with a solution of 12.5% Dextrose solution and 1 IU of human growth hormone (hGH) for injection into the first metatarsophalangeal joint (intraarticular). Before injecting, air was expelled from the syringe through a 22-gauge needle. Though volume varied slightly, approximately 1 mL was used per injection. In each treatment session, the anterior, posterior, medial, and lateral portions of the MTPJ were injected 8 times with approximately 10 cc of solution. After treatment, patients were left to rest under moist heat for 10 – 15 minutes. The heat was removed, and the patient’s toe was cleaned with 3% hydrogen peroxide. In the days following the procedure, patients were allowed to return to normal non-strenuous activities. Patients were advised to avoid such medications as ibuprofen, which block the inflammatory process. However, we did approve of the use of acetaminophen-based analgesia. Patients returned for treatment every four weeks, depending on their schedule, completing from 3 – 6 treatments. As for data collection, all twelve patients completed telephone follow-up within six months to two years, averaging 10.8 months after full treatment. In phone surveys, patients were asked to rate their toe stiffness, to record the number of pain pills taken, and to report any surgeries. Patients also assessed their own pain using Visual Analog Scale (VAS) scores, rating their pain from 0 to 10, 0 being no pain and 10 being constant, excruciating pain. Using Microsoft Excel, data was compiled by an outside analyst. A paired student t-test was used, which evaluated measurements of pain, stiffness, and range of motion to determine the statistical significance of improvements. After receiving injections, patients reported significant reduction in pain and stiffness. The big toe was treated in twelve participants. Though the mean number of treatments was 4.0, the range was 3 – 6 sessions. The average volume of solution injected per visit was 10.0 mL. Figure 6 Survey responses before and after Prolotherapy on levels of pain with various activities. 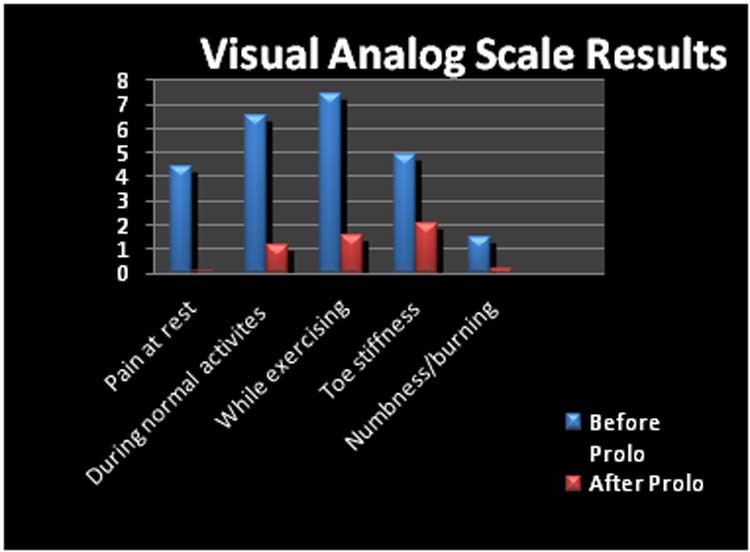 Using the Visual Analog Scale (0 = no pain and 10 = crippling/severe pain), patients judged their pre- and post-treatment status on a number of issues: pain levels, stiffness levels, amount of numbness, and need for medications or surgery (Fig. 6). The before and after Prolotherapy VAS scores were compared using a paired student t-test. All p-values for pain were statistically significant at the p <0.0004 level. Patients’ subjective experience of pain offers the best measure for statistical accuracy. Patients were asked to rate their pain levels on a scale of 0 to 10, with 0 being no pain and 10 being severe crippling pain. All 12 patients reported pain as a symptom. Thus, patients were asked to report pain levels before and after Prolotherapy in these three categories: 1) pain at rest, 2) pain with normal activities, and 3) pain with exercise. Concerning 1) pain at rest: prior to Prolotherapy treatment, VAS pain levels averaged 4.42. None of the patients had a starting pain of less than two. After Prolotherapy treatment, VAS pain levels averaged 0.083. Only one patient reported a VAS pain level of 1, and all others reported zero. Concerning 2) pain with normal activities: prior to Prolotherapy treatment, VAS pain levels averaged 6.50. Five of 12 patients could walk less than fifty feet without pain; seven of 12 could not walk a half-mile without pain; and ten of 12 could not walk a full mile. After Prolotherapy, all but one patient reported no restrictions in walking any distance without pain, and a VAS pain level of 1.17. Concerning 3) pain with exercise: prior to Prolotherapy, five of 12 patients reported being severely compromised (only 0 to 30 minutes possible) in their ability to exercise, and a VAS pain level of 7.42. Of the twelve patients, two were totally compromised and unable to exercise; three were moderately (only 30 to 60 minutes possible). Over half of the patients were severely to totally compromised in their athletic abilities prior to treatment. After Prolotherapy, seven of 12 patients reported being able to exercise as much as they wanted without impediments and with satisfaction, with a VAS pain level of 1.58. Other physical improvements occurred, notably decreases in stiffness (from 4.92 to 2.08) and numbness (from 1.50 to 0.17). When comparing the three previous categories before and after Prolotherapy, all reached a statistically significant outcome with a paired student t-test of p = <0.0004. This p-value confirms that the numerical results, when compared and tallied, exceed the mathematical probability of mere chance. Thus, this retrospective study, without a control group, demonstrates that Hackett-Hemwall Dextrose Prolotherapy decreases pain and improves the quality of life for patients with metatarsophalangeal joint pain—unresolved by previous therapies, medications, and interventions. As a result of Prolotherapy, eleven of 12 patients reported a greater than 75% improvement in the activities of daily living that continued to the end of the study. Of the two patients who were told they needed surgery, both felt sufficient pain relief with Prolotherapy to avoid surgery. After the study period, patients experienced overall improvement in range of motion, ability to walk and exercise, as well as relief of stiffness and numbness/burning. The questionnaire supplied one additional area of data: the use of pain medications. Before Prolotherapy treatment, seven took no pain pills for their condition; five took one to two pills daily. After treatment, one of 12 continued on medication. Since patients with hallux valgus may require different approaches, a variety of surgical options are offered because one is best suited for each specific type of hallux valgus. Appropriate treatment selection, therefore, is not just a matter of choosing a good option; even a good choice can leave patients with ongoing problems. In this regard, a Cochrane review notes that 25 – 33% of patients were dissatisfied at follow-up. This high failure rate confirms the difficulty of selecting an appropriate treatment for hallux valgus—a difficulty that arises from the complex nature of this degenerative disease. Because Prolotherapy addresses many of the underlying causes of hallux valgus, its effectiveness as a treatment is more likely, making Prolotherapy a more reliable option. Although Prolotherapy has a long history of treating pain, this study is the first to document its success as a treatment for chronic metatarsophalangeal joint pain. Three double blind studies establish a statistically significant improvement in osteoarthritis with Prolotherapy. [30, 31, 32] Prolotherapy’s apparent success with osteoarthritis and ligament laxity is encouraging, demonstrating its potential as a viable alternative to the traditional treatments of hallux valgus. The mechanisms by which Prolotherapy decreases pain are multifactorial. Prolotherapy, a known stimulant for the regeneration of tendons and ligaments, also repairs articular cartilage and menisci. In cases of osteoarthritis, Prolotherapy has been shown to return motion to painful joints, and in patients with severe dysfunction, to alleviate the need for joint replacement. [33, 34] As a comprehensive treatment, Prolotherapy is well-suited for metatarsophalangeal joint pain, which is also multifactorial. The etiology of hallux valgus, for example, includes poor fitting footwear, bony abnormalities in the shape and length of the metatarsal head, foot pronation (flat-footedness), and inflammatory joint diseases. [9, 35] Due to Prolotherapy’s cascade of healing factors that regenerates tissues, the underlying factors that cause both hallux valgus and hallux rigidus can be remedied. Specifically, the underlying condition of both hallux valgus and hallux rigidus is the instability that causes osteoarthritis of the MTP joint, initiating bone growth to stabilize the joint. (This growth in boney tissue occurs mainly on the medial side of the foot, producing the characteristic bump or bunion.) The instability that predisposes joints to osteoarthritis typically starts when ligaments and tendons supporting the joint become weakened or injured. Because the joint is no longer held in place by healthy ligaments and tendons, unstable joint motion develops and eventually exerts a strong pressure on parts of the cartilage. Then cartilage degenerates, which leads to a crunching and grinding joint. With time, the body reacts to this instability by contracting the muscles in the area. Eventually tense muscles get “knotted up” and finally release when they lose their strength due to fatigue. Because of this muscular failure, bone mass increases in an attempt to stabilize the joint. In a last ditch effort to recover joint stability with bone growth, a completely frozen joint occasionally occurs. 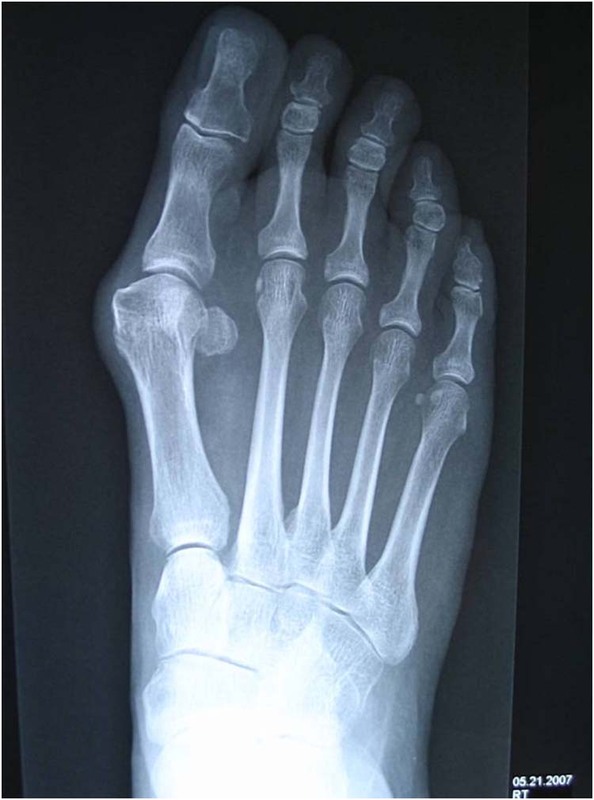 Due to instability—pathological bone growth is what produces hallux rigidus. By re-growing cartilage and strengthening ligaments and tendons, Prolotherapy can stop the arthritic cascade, initiating a healing cascade that stabilizes the joint and reverses the degeneration to arthritis. To enable this reversal and regeneration, Prolotherapy historically has utilized many solutions, but Dextrose has been proven to be a uniquely safe and effective irritant (sclerosant). Sclerosant is derived from the word “sclera,” which refers to the tough, fibrous white part of the eye and, thus, a sclerosant causes a toughening of injected tissues. Dextrose Prolotherapy is presumed to work by virtue of such mechanisms as direct contact, osmotic tissue absorption, and inflammation. Practitioners of Prolotherapy realize that typical human cells contain 0.1% Dextrose (D-glucose). When injected with a concentrated glucose solution, tissues respond by increasing cellular protein synthesis, DNA synthesis, and cell volume—all components of cellular proliferation. [36, 37, 38, 39, 40] Introduction of extracellular Dextrose increases growth factors near the injection site. These growth factors include platelet-derived growth factor, transforming growth factor-beta (TGF-β), epidermal growth factor, basic fibroblast growth factor, insulin-like growth factor, and connective tissue growth factor, which are especially suited to the repair of tendons, ligaments, and soft-tissues. [41, 42, 43, 44, 45, 46] Furthermore, studies show that Dextrose-based injections stimulate inflammation, fibroblastic proliferation, and repair of articular cartilage defects. [47, 48, 49, 50, 51, 52, 53] Combined with 1 IU, human growth hormone (hGH) may be used to treat the MTP joint for increased cartilage growth. The connection between hGH and cartilage growth is readily apparent in those suffering from acromegaly, a condition whereby the pituitary gland secretes too much hGH that causes the growth of excess cartilage. As a treatment for MTP joint pain, Prolotherapy provides long-term relief, which may not be the case for other healthcare options. The efficacy of those options is not known, since follow-up in hallux valgus studies is often insufficient or nonexistent. Although many studies have been done on hallux valgus, the Cochrane review shows that the follow-up techniques used in these studies were considered of “dubious relevance” because they failed to accurately assess relief of symptoms. In the material covered by the Cochrane review, only one study asked patients if they were better after surgery than before. In light of these findings, Kilmartin suggests, “future research should include patient-focused outcomes and follow-up periods of at least 5- to 10-years.” This retrospective study on patients suffering from hallux valgus and hallux rigidus concentrated on patient outcomes—assessing pain, stiffness, and range of motion. As a result of Prolotherapy, eleven of the twelve patients studied reported a greater than 75% improvement in the activities of daily living that continued to the end of the study. While not all of our study patients were contacted five years after treatment, 3 out of 12 patients reported a favorable assessment between 5- to -12 years after their final treatment. Given these preliminary positive results, Hackett-Hemwall Dextrose Prolotherapy’s potential for healing and regenerating tissues and not just for reducing pain makes it a promising, safe treatment option for chronic first metatarsophalangeal joint pain. 2. Gilheany M, Landorf K, Robinson P: Hallux valgus and hallux rigidus: a comparison of impact on health-related quality of life in patients presenting to foot surgeons in Australia. J Foot Ankle Res. 2008, 1(1): 14. 3. Board T, Fox A, Barrie J: Foot and Ankle Hyperbook. East Lancashire Hospital NHS Trust. http://foothyperbook.com/elective/hr/halluxRigidusIntro.htm. 4. Hunt, K: Adult Foot Disorders: Common Ailments in “Experienced” Feet. Stanford Hospital Library. http://www.shlnews.org/?p=416. 5. Karasick D, Wapner K: Hallux rigidus deformity: Radiologic assessment. AJR Am J Roentgenol 1991, 157(5): 1029 – 1033. 7. Dawson J, Thorogood, Marks S, Juszczak E, Dodd C, Lavis, Fitzpatrick R: The prevalence of foot problems in older women: a cause for concern. J Public Health Med 2002, 24(2): 77 – 84. 8. Ferrari J. Bunions. : Clin Evid (Online) 2009, pii: 1112. 9. Piqué-Vidal C, Sole M, Antich J: Hallux valgus inheritance: pedigree research in 350 patients with bunion deformity. J Foot Ankle Surg 2007, 46(3): 149 – 154. 10. Torkki M, Malmivaara M, Seitsalo S, Hoikka V, Laippala P, Paavolainen P: Surgery vs orthosis vs watchful waiting for hallux valgus. A randomized controlled trial. JAMA 2001, 285(19): 2474 – 2480. 11. Robinson AH, Limbers J: Modern concepts in the treatment of hallux valgus. J Bone Joint Surg Br 2005, 87(8): 1038 – 1045. 12. Ferrari J, Higgins J, Prior T: Interventions for treating hallux valgus (abductovalgus) and bunions. Cochrane Database Syst Rev 2004, (1): CD000964. 13. Maffulli N, Longo U, Marinozzi A, Denaro V: Hallux valgus: effectiveness and safety of minimally invasive surgery. A systematic review. Br Med Bull 2011, 97(1): 149 – 167. 14. Hackett G, Hemwall G, Montgomery G: Ligament and tendon relaxation treated by prolotherapy, 5th ed. Oak Park, IL: Gustav A. Hemwall, 1991. 15. Hackett G: Low back pain. Br J Phys Med 1956, 19(2): 25 – 35. 16. Hackett G: Shearing injury to the sacroiliac joint. J Int Coll Surg 1954, 22(6, part 1): 631 – 642. 17. Hackett G, Henderson D: Joint stabilization: An experimental, histologic study with comments on the clinical application in ligament proliferation. American Journal of Surgery 1955, 89: 968 – 973. 18. Hackett G: Back pain following trauma and disease – prolotherapy. Military Medicine 1961, 517 – 525. 19. Hackett G: Prolotherapy in whiplash and low back pain. Postgraduate Medicine 1960; February: 214 – 219. 20. Hauser R, Hauser M, Cukla J: A retrospective observational study on Hackett-Hemwall dextrose prolotherapy for unresolved foot and toe pain at an outpatient clinic in rural Illinois. Journal of Prolotherapy 2011, 3(1): 543 – 551. 21. Hiti CJ, Stevens K, Jamati M, Matheson G: Athletic osteitis pubis. Sports Med 2011, 41(5): 361 – 376. 22. Kim WM, Lee H, Jeong C: A randomized controlled trial of intra-articular prolotherapy versus steroid injection for sacroiliac joint pain. J Altern Complement Med 2010, 16(12): 1285 – 1290. 23. Grote W, Delucia R, Waxman R, Zgierska A, Wilson J, Rabago D: Repair of a complete anterior cruciate tear using prolotherapy: a case report. Int Musculoskeletal Med 2009, 31(4): 159 – 165. 24. Rabago D, Slattengren A, Zgierska A: Prolotherapy in primary care practice. Prim Care 2010, 37(1): 65 – 80. 25. Rabago D.: Prolotherapy for treatment of lateral epicondylosis. Am Fam Physician 2009, 80(5): 441 – 444. 26. Rabago D, Best T, Zgierska E, Ryan M, Crane D: A systematic review of four injection therapies for lateral epicondylosis: prolotherapy. Br J Sports Med 2009, 43(7): 471 – 481. 27. Yelland M, Sweeting K, Lyfogt J, Ng S, Scuffham P, Evans K: Prolotherapy injections and eccentric loading exercises for painful Achilles tendinosis: a randomised trial. Br J Sports Med 2011, 45(5): 421 – 428. 28. Robinson AH, Limbers J: Modern concepts in the treatment of hallux valgus. J Bone Joint Surg Br 2005, 87(8): 1038 – 1045. 29. Ferrari J, et al. : Interventions for treating hallux valgus (abductovalgus) and bunions. Cochrane Database Syst Rev 2004, (1): CD000964. 30. Reeves KD, Hassanein K.: Randomized prospective double-blind placebo-controlled study of dextrose prolotherapy for knee osteoarthritis with or without ACL laxity. Alternative Therapies, 2000;6: 68 – 79. 31. Reeves KD, Hassanein K.: Randomized, prospective, placebo-controlled double-blind study of dextrose prolotherapy for osteoarthritic thumb and finger (DIP,PIP, and trapeziometacarpal) joints: evidence of clinical efficacy. The Journal of Alternative and Complementary Medicine 2000, 6: 311 – 320. 33. Hauser, R: The regeneration of articular cartilage with prolotherapy. Journal of Prolotherapy 2009, 1: 39 – 44. 35. D’Arcangelo PR, et al. : Radiographic correlates of hallux valgus severity in older people. J Foot Ankle Re 2010, 3: 20. 36. Reeves KD, Fullerton BD, Topol G.: Evidenced-based regenerative injection (prolotherapy) in sports medicine. In Seidenberg P, Beutler A (eds.) The Sports Medicine Resource Manual 2008, Saunders Publishing, Philadelphia PA, Chapter 50. 37. Natarajan R, Gonzales N, Xu L.: Vascular smooth muscle cells exhibit increased growth in response to elevated glucose. Biochemistry and Biophysic Research and Communication1992, 186: 552 – 560. 38. McGinn S, Poronnik P, King M.: High glucose and endothelial cell growth: novel effects independent of autocrine TGF-beta 1 and hyperosmolality. American Journal of Physiology and Cell Physiology 2003, 234: C1374 – C1386. 39. Berl T, Siriwardana G, Ao L.: Multiple mitogen-activated protein kinases are regulated by hyperosmolality in mouse IMCD cell. American Journal of Physiology 1997, 272: 305 – 311. 41. Di Paloa S, Gesualdo L.: High glucose concentration induces the over expression of transforming growth factor-beta through the activation of a platelet-derived growth factor loop in human mesangial cells. American Journal of Pathology 1996, 149: 2095 – 2106. 42. Oh JH, Ha H, Yu MR.: Sequential effects of high glucose on mesangial cell transforming growth factor-beta 1 and fibronectin synthesis. Kidney International 1998, 54: 1872 – 1878. 43. Murphy M, Godson C, Cannon S.: Suppression subtractive hybridization identifies high glucose levels as a stimulus for expression of connective tissue growth factor and other genes in human mesangial cells. Journal of Biology and Chemistry 1999, 274: 5830 – 5834. 44. Fukuda K, Kawata S, Inui Y.: High concentration of glucose increases mitogenic responsiveness to heparin-binding epidermal growth factor-like growth factor in rat vascular smooth muscle cells. Arteriosclerosis Thrombosis and Vasculature Biology 1997, 17: 1962 – 1968. 45. Ohgi S, Johnson PW. : Glucose modulates growth of gingival fibroblasts and periodontal ligament cells: correlation with expression of basic fibroblast growth factor. Journal of Periodontal Research 1996, 31: 579 – 588. 46. Reeves KD. : Prolotherapy: injection of growth factors or growth factor production stimulants to growth normal cells or tissue. In Waldman SD (ed): Pain Management, Philadelphia, Elsevier 2006, pp. 1106 – 1127. 47. Sanchez M, Anitua E, Orive G.: Platelet-rich therapies in treatment of orthopaedic sport injuries. Sports Medicine 2009, 39: 345 – 354. 48. Jensen KT, Rabago DP, Best TM. : Early inflammatory response of knee ligaments to prolotherapy in a rat model. Journal of Orthopaedic Research 2008, 26: 816 – 823. 49. Kim HJ, Kim SH, Yun DH. : The effects of anti-inflammatory drugs on histologic findings of the experimental prolotherapy model. Journal of the Korean Academy of Rehabilitation Medicine 2006, 30: 378 – 384. 50. Ahn KH, Kim HS, Lee WK. : The effect of the Prolotherapy on the injured Achilles tendon in a rat model. Journal of the Korean Academy of Rehabilitation Medicine 2002, 26: 332 -336. 51. Oh S, Ettema AM, Zhao C.: Dextrose-induced subsynovial connective tissue fibrosis in the rabbit carpal tunnel: a potential model to study carpal tunnel syndrome. Hand 2008, 3: 34 – 40. 52. Kim HS, Jeong TS, Wim WS. : Comparison of histological changes in accordance with the level of dextrose-concentration in experimental prolotherapy model. Journal of Korean Academy of Rehabilitation Medicine 2003, 27: 935 – 940. 53. Kim SA, Kim EH, Kim SY. : The effects of hyperosmolar dextrose and autologous serum injection in the experimental articular defect of rabbit. Journal of the Korean Academy of Rehabilitation Medicine 2006, 30: 173 – 178. 54. Kilmartin TE, O’Kane C: Combined rotation scarf and Akin osteotomies for hallux valgus: a patient focused 9 year follow up of 50 patients. J Foot Ankle Res 2010, 3: 2.